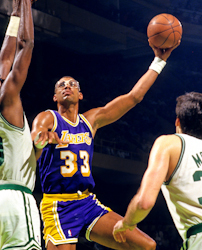 Kareem Abdul-Jabbar has scored the most points in NBA history. This chart provides leading statistics on National Basketball Association players' total number of career regular season points scored. A list of National Basketball Association players by total career regular season points scored. A progressive list of scoring leaders showing how the record increased through the past seasons. The current actively playing scoring leader is LeBron James with 32,543 total points scored across his career. The player with the highest number of points scored in NBA history is Kareem Abdul-Jabbar with 38,387 total points scored. The record for total number of points scored in a single season belongs to Wilt Chamberlain at 4,029 points. The following is a list of National Basketball Association players by total career regular season points scored. This is a progressive list of scoring leaders showing how the record increased through the years. ^ a b "NBA Progressive Leaders and Records for Points". Basketball-Reference.com. Retrieved March 25, 2015. ^ Rounded to the nearest tenth. ^ First adopted in the 1979–80 season.